The Worlds most intelligent BB? 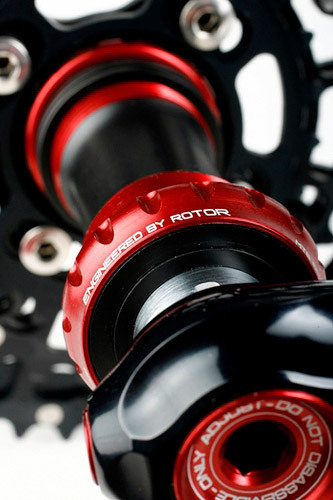 The Self Aligning Bottom Bracket from ROTOR is the standard BB of the Ágilis crankset and is compatible with most cranksets from other major manufacturers. 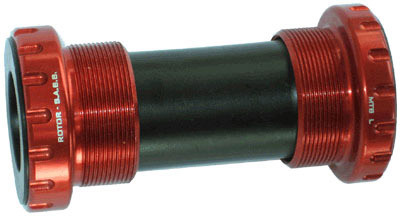 The SABB uses external bearings, but contains a fundamental difference to every other outboard bearing bottom bracket system: the bearings are held within ball-in-socket housings, allowing them to swivel into absolutely parallel alignment with each other, irrespective of any outside influences. This automatic self-alignment of the bearing races occurs independent of any possible frame imperfections or stresses: unparallel faces, non perfect concentricity of the threading in both sides, deformation due to excessive loading, etc. Additionally, due to its user friendliness and simplicity, the consumer can change the bearings without the need of any special tool. Anybody who is tired of replacing their standard BB cups from other brands can easily retrofit the ROTOR SABB system to their bike, guaranteeing thousands of kilometres of care free cycling. Simple to fit at home. 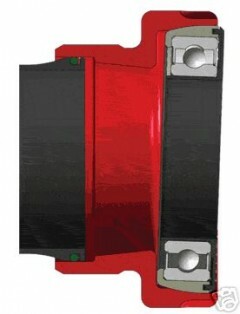 Ceramic bearings show 10% less rolling resistance and will also be more wear and corrosion resistant than steel. An awesome upgrade to shimano 10 speed outboard bearings for road or XTR.